This is not a big moment, but Rutgers beat up on a lowly FCS opponent in Morgan State. That game might be the only win for the Scarlet Knights all season, as they go into Big Ten play. They will for sure lose to every team in their division, maybe they can pull out a surprise win this season. Baylor is the only team in the Power Five conferences that has yet to win a Game. The Baylor Bears are still dealing with NCAA sanctions coming from their last regime. The Bears go into Big 12 play winless and I do not expect to win a game any time soon. This season was supposed to be bad for the Bears, but it might be really bad. Wisconsin and Penn State are in the Top 10 of the AP Poll and control their own destiny to the playoff. The Wisconsin Badgers have looked great this season and have only one tough game, Michigan at home, standing between them and an undefeated regular season. Penn St has not had a big win yet, but they big games coming up against Michigan and Ohio State. The winner of those games will go to the Big Ten title game, so the road is not dim for the Nittany Lions. Alabama and Oklahoma have had the two biggest wins of the College Football season thus far. This week both teams played inferior opponents to fix any holes on their times before conference play. Alabama has a chance to go undefeated after the result of the LSU game and make it to their fourth straight playoff. Oklahoma will have to beat up on Oklahoma State to win the Big 12 and go to the playoff. LSU Tigers came into this week ranked in the Top 10 and they leave ranked 25. The Tigers got blown out by Mississippi State and lost by 30 points. LSU had a chance to start SEC play with an easy win but they failed. With the Alabama game still looming, you have to wonder if the Tigers will be a three or four loss team this year. The game between Florida and Tennessee was really bad for three quarters, but things changed in the last quarter. The Gators were able to fight off the Vols and get a big win to start SEC play. The Gators are the favorites to win the SEC East, this win was a big one to that goal. The Vols had a chance to upset Florida and restore some faith in the program, but died on National TV by a big play. Clemson had a big win early in the season to start off ACC play. They went into Louisville and were able to shut down Lamar Jackson and the high potent offense. The Tigers cleared one of their biggest hurdles of the season and now only Florida State stands between them and winning the ACC. Lamar Jackson got shut down by Clemson and might have lost his chance to win the Heisman this season. The Cardinals do not control their own destiny to the playoffs. Having their biggest game of the season this early, does not give Lamar many opportunities to have his “Heisman Moment” late in the season. Texas had a chance to get a big statement win against USC, but failed in overtime. The Longhorns played great for four quarters but could not stop the Trojans late in regulation and in both overtime periods. It has been a disappointing season for the Longhorns and they blew a big opportunity to right the ship on Saturday night. Darnold had another big win by beating the Longhorns. 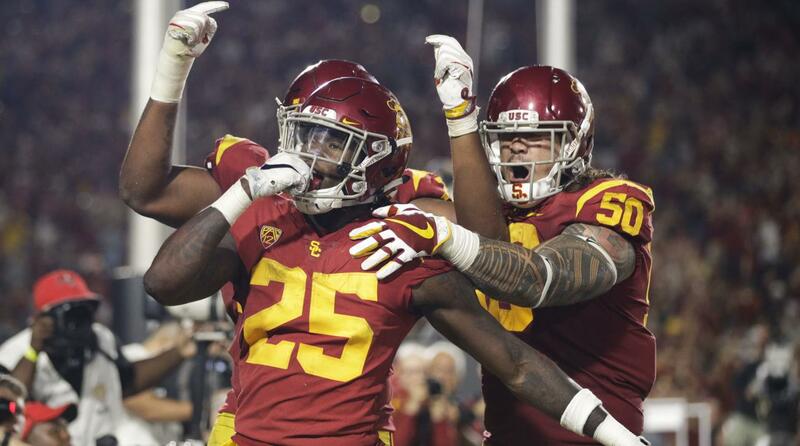 The Trojans were expected to win in a blow out, but the offense never got going and Darnold had some really bad plays early in the game. Darnold improved his play and took the Trojans down the field to tie the game late in regulation and was great in Overtime to win the game. At this rate, he is for sure the player that the Jets are going to target with their high draft pick.